Mahbubnagar (Telangana), Prime Minister Narendra Modi said Tuesday Indians would have needed Pakistani visa to visit Hyderabad had Sardar Vallabhbhai Patel had not liberated it from the Nizam’s rule. Recalling the role of Patel in the merger of the erstwhile Hyderabad princely state with the Indian union, Modi said it was only due to the country’s first home minister that we are able to say “Bharat Mata ki Jai” in the capital city of the present-day Telangana. Speaking at an election rally here, Modi said had Patel, the “son of a farmer”, been India’s first prime minister, the condition of farmers would not have been bad. 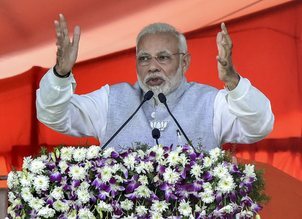 Modi said his government is committed to Telangana’s development and welfare of its people, and listed out various centrally-funded projects in the state. Modi alleged the Congress and TRS were engaged in “WWF style wrestling” in Telangana polls, suggesting the contest was staged. The Congress and TRS are “parivarvadi (family-centric) parties”, he said. The caretaker chief minister was “chela” (protege) of Andhra Pradesh Chief Minister N Chandrababu Naidu and UPA chairperson Sonia Gandhi, Modi said. “Rao got initial training in undivided Andhra Pradesh when he was an apprentice in the Chandrababu Naidu government (as minister). Later he went to Delhi and took apprenticeship in Madam’s (Sonia Gandhi’s) government (UPA). A person who did apprenticeship under such gurus will definitely destroy Telangana”, Modi said. “If you entrust Telangana into their hands for five years, your sacrifice will go waste, you future will be dark,” the prime minister said, and asked the voters to take a pledge in the memory of the martyrs to Telangana’s cause that they will ensure not a single Congress candidate wins. Modi said Rao cannot give anything new to Telangana and that the time had come to “give him a send-off”.